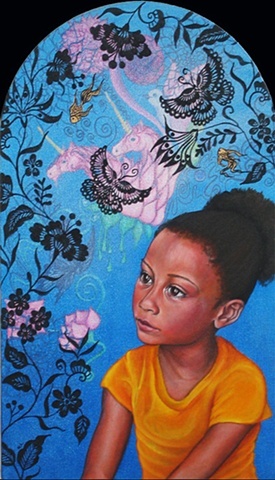 This is a portrait of a very adorable and dreamy little girl named Ananda. I have her pictured day dreaming about unicorns and all sorts of fantastical ideas but at the same time she is witnessing the clarity of the universal patterns that underlay everything. This painting is available and I can also paint a portrait of someone in this fashion. Please contact me for details.